Ever dream of a free-spirited career? One woman’s journey from corporate IT sales to creative artistry. Marilyn Slinkman has always had a creative side, but she rarely had the time to indulge it. Her young adult years were spent in the U.S. Army and studying at East Tennessee State University, before she moved to Raleigh in 1990 with her young son. With a knack for sales and a minor in computer science, she embarked on a career in IT sales. Eventually, her career took her to SAS and Cisco Systems in the Triangle. But in the middle of her professional career, she was confronted with a life-altering family crisis when her husband became critically ill. That’s when she decided to change course. After years of tinkering with jewelry making, Slinkman decided to go all-in. 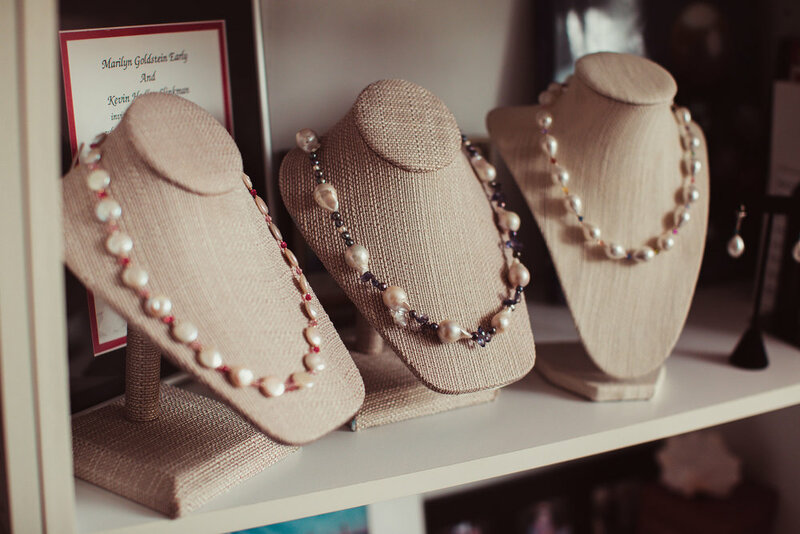 Her part-time business, Carolina Pearl, became her full-time passion. She no longer has the corporate paychecks coming in, but she also has no quarterly sales quotas hanging over her head—and no need to set an alarm clock. 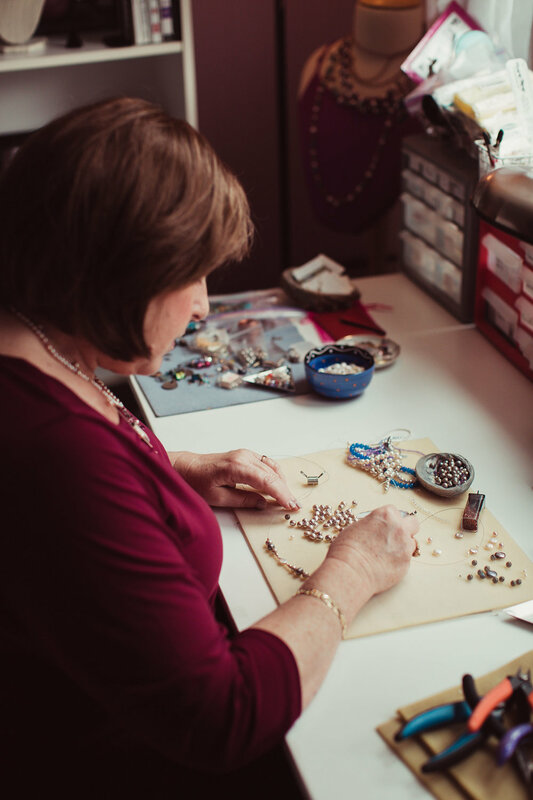 Cary Living: When did you become interested in making jewelry? Slinkman: Around 2002, I was working at SAS in a high-stress position with enormous quotas and I decided I needed a creative outlet to deal with some of that stress. I took an “Intro to Beading” class that was offered on the SAS campus, and that rekindled my creative side. After that first class, [jewelry making] started as a hobby just to use my hands for some stress reduction and not to smoke. Then I wore something [I had made] to the dentist’s office and the dentist commented, “Where did you get that? Will you make me one?” I thought, maybe I should take this to the next level. Did you already feel like you had an artistic side to your personality? I had done it in the 1970s, as a hobby, and I remember in my teens going to a beach in New Jersey and finding a bead store. I have a picture of me at 17 wearing a necklace that I made. I used a needle and thread, strung that necklace together, and thought I was hot! When did you decide to do this full time? About a year and a half ago. For the last 13 years, Carolina Pearl was a business, but not at the level that it has been in the past couple of years. The tipping point was when my husband suddenly became critically ill. He required a heart transplant, and that really changed my perspective on living life to the fullest and following your passion. So I decided to retool and propel this business into something full time. I would imagine it takes some confidence to walk away from the security of a steady income? I had made the decision to stop working in corporate America. I decided that this was the time to take years of sales experience, building relationships, and doing what I loved, and put it all together—and work for myself. Being an entrepreneur is a journey. I was scared, but I’ve been very lucky. The fear factor was very strong; but I had to be confident and know that I’m doing what I love and I’m not doing it for the money. So, do you work with pearls and gemstones? I work primarily with fresh water pearls, Swarovski crystals, stones, beads, silver, and gold. My customer base is as diverse as you could imagine. I have a customer in Texas who has 17 pairs of my earrings. And I understand you have a celebrity customer. My moment was in 2004 when [TV commentator] Nancy Grace invited me to New York City so she could look at the “rookie” jewelry I was making. I knew if I could get her to wear my jewelry it would be a great advantage for me. She was very gracious and became a great customer. That gave me confidence to continue. Why do you think this became such a passion for you? First of all, I get to use my hands. I love the design element of it; you can tap into your creativity. Pearls are my thing, and every woman can wear a pearl. I also found I really enjoy the teaching aspect. I love when my students turn it into a little business of their own, or a hobby. That’s very fulfilling for me, even though I’m teaching my competition. I had to learn the hard way and get organized. My day is a lot on the computer, whether it’s searching for and procuring the right materials, sorting the inventory, designing, advertising, making the product, marketing, or shipping. It’s as complex as if I had a brick-and-mortar location. It’s just as difficult working from your home, getting the right licenses and permits, getting the website going. I spend a lot of time, whether I’m in the studio or on the laptop. Primarily my audience is female, but I’ve had a gentleman or two want to make something for his wife or give it as a gift. There’s really no age group. I do teen and tween parties. My products range from $15 to $200, depending on the complexity and the materials. Has this validated your decision to step away from corporate life? Absolutely. This is the best decision I have ever made. I want to do this until I no longer can do it. There are tradeoffs in everything you do in life. Yes, I miss that steady income, but this gives me fulfillment. You will never meet a rich artist. I don’t do it to be rich; I do it to be happy. How do you look back at your corporate career? Fondly. I was a young, uneducated Army veteran, and I had to get an education and raise a son by myself. I was very successful in my professional career, and I’m thankful. That actually made it easier for me to do what I want to do at my age. Have you made the transition easily? It is a transition. I don’t have to get up in the morning if I don’t want to. People have asked me, “What are you doing now?” And I say, “Nothing before 10am” I’m a night creature. Almost everything I make is done after midnight. I tend to my household things and appointments during the day, and then around 3pm I start my Carolina Pearl life. I work until two or three in the morning. The ideas just come to me.